I wish I could say it was a nice relaxing trip for her and that I was a thoughtful hostess who didn't stress her out at all, but let's be honest here: I'm a nutcase and I love to do things! ALL.THE.TIME. I'm not sure she was quite prepared for all the walking I made her do (so much to see! let's go there! NOW! what's over there? SQUIRREL!) and I know the culture shock was a little overwhelming. I had forgotten how scary it can be in a new country where no one speaks your language (this isn't entirely true around here, but it certainly feels that way at times) and where you feel intimidated because the people give you dirty looks a lot (also, not entirely true, but that's another post for another day). I wish I had found a better way to help her deal with that, but the truth is- sometimes you just have to jump in, especially if you're only visiting for a short time. And, unfortunately, I'm not an overly sympathetic person. That's something I should work on. It's on the list. I feel pretty fortunate that not only do I have a mom willing and able to travel but also that we had the opportunity to see some new places together. I wish we could have done more, but we had truly awful weather most of the time she was here. I really wanted to take a day trip down to Karlsruhe and over to Triberg to see the waterfalls, but between the mini-monsoon season we had and a nasty spring cold I caught, that didn't happen. I also planned a 4 castle hike for one day- 4 gorgeous castles all along the Rhein River but when I told mom & Mike my plan, I got The Look. You know - the one that says, "have you lost your friggin mind?! We do NOT want to be in a car all day and we do NOT want to walk up 4 mountains and around 4 castle grounds IN.ONE.DAY." So, um, yeah... I mentioned that I'm an over-hyper nutcase, right? In retrospect, that was probably a lot to try to accomplish in one day. 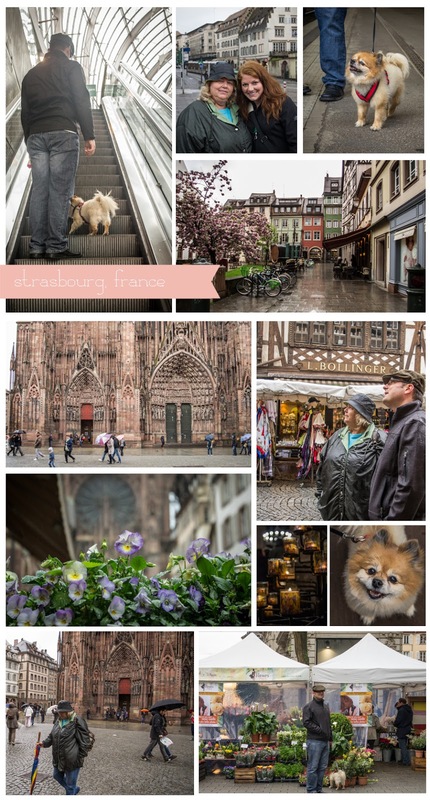 Strasbourg is a gorgeous little town in the Alsace region in France, about an hour and a half from where I live. It's one of my favorite places to visit and we took my sister, Jessica and her fiance, Kevin, there at Christmas time, too. Every time I've been it's been raining (I think I'm just used to it by now), but one day I really do want to go back when the weather is nice and get some good shots of this city. The main attraction of Strasbourg, for me, is the cathedral. It's one of my favorite churches to visit. It's not as big or overwhelming as some of the others, but I love it. It's magnificent to me to think how long these monstrous structures have been standing and how long they took to build. Talk about dedication. Other than the cathedral there are cute little shops and restaurants. They have a whole little section with tons of chocolate shops that's pretty awesome! If you're able to visit in the wintertime, they make some really fantastic hot chocolate. 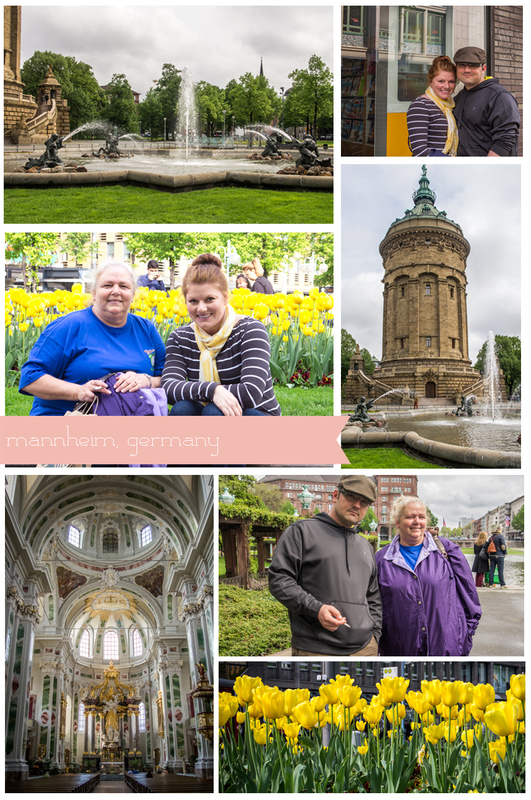 A lot of people overlook Mannheim for a day trip, but I gotta tell ya, folks, Mannheim is pretty fun! The city center near the train station has some great shopping (blocks and blocks of it! ), several nice parks, and a REAL Starbucks. Yup. I said it. The secret is out. In less than 45 minutes I can hold in my hand a real Caramel Frappuccino. Mannheim also boasts at least 2 American style shopping malls and a movie kino (theater) with movies in English. And that's just the stuff I've found. One of the best parts? It's a short train ride away if we don't feel like driving. Heidelberg. Oh, Heidelberg. How I wish we could live there! If you ever get the chance to come to this part of Germany, consider visiting this city. I can't think of anything truly spectacular about it, but we always enjoy visiting. It's just pretty. 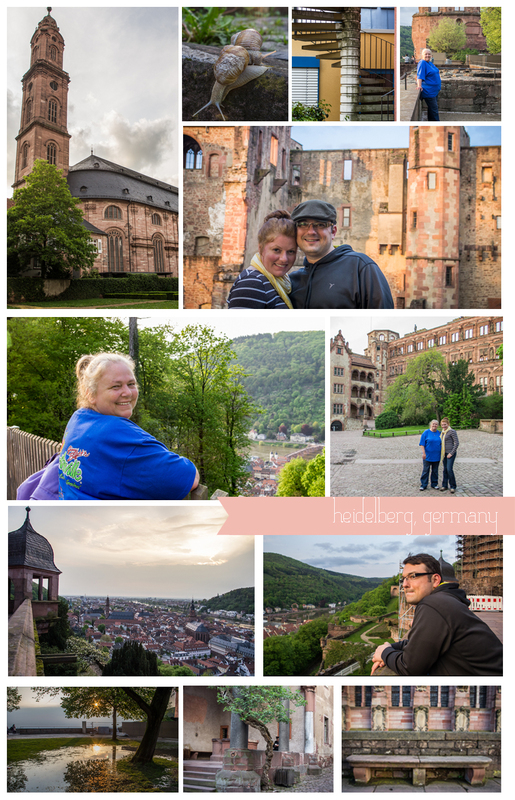 Heidelberg is one of the few cities that wasn't hit too hard during the World Wars. Understandably, a lot of this area was obliterated and has been rebuilt, but Heidelberg wasn't a main target and a lot of the city is original. This was our first time to go up to the castle and I'm so glad we did. Even though it's under renovation, it was still phenomenal. It's HUGE! I wasn't expecting that. That picture of my mom above? That's probably my favorite one of her from this trip. I think it might be the only one I got with a "real smile." Usually she gave me the cheesy grin or made a goofy face or hid from the camera. In case you're wondering about my goofball tendencies, I come by them honestly! Remember those 4 castles I wanted to visit? 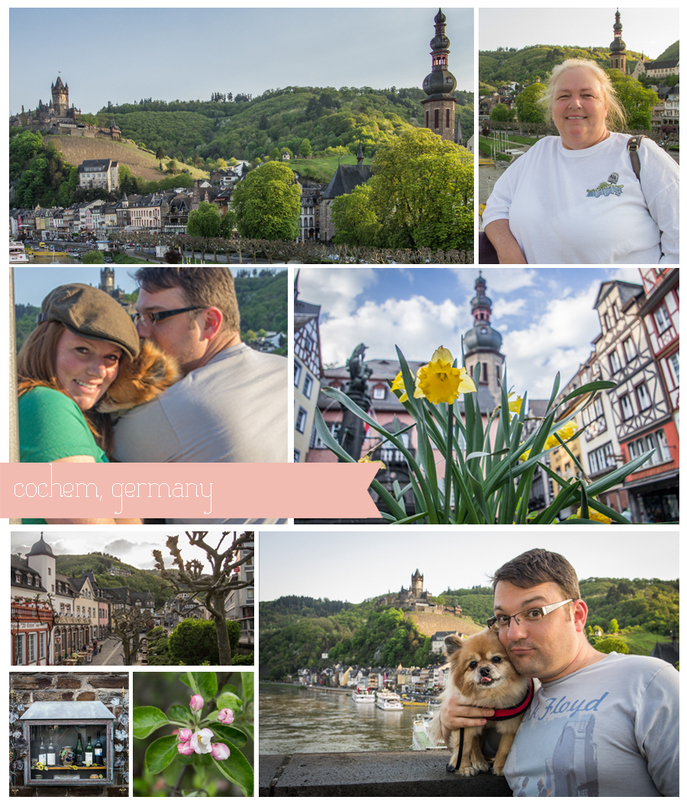 Cochem was one of them. We got a bit of a late start this day because we were relaxing on a lovely Sunday arguing over where to go and by the time we finally got there, things were closing up. We couldn't figure out how to get to the castle- the GPS kept taking us up the world's tiniest road that went in a circle. It didn't go near the castle, so I don't know what the GPS was trying to do. In any case, we saw it from a distance and from the neighboring hill and I think Mom was happy with that. I was thankful to just have a day of nice weather to be outside in. So that's it for our day trips with my mom. We also took some pretty cool over-nighters. Next up: Paris!